With Magic: The Gathering's standard rotation now less than two weeks away, we hit the drawing board to see what kind of post-rotation deck we can come up with for less than $100. Izzet possible? You bet! 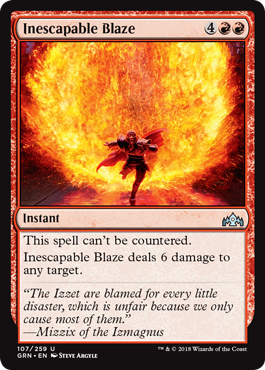 Ravnica's blue-red Izzet guild looks to have a lot of synergy with the remaining sets in Magic's soon-to-be-new standard format. The colors also have a lot of low-priced, yet effective cards. Taking some inspiration from the Theros block and its Spellheart Chimera decks, we've built one around two similar cards: Crackling Drake and Enigma Drake. 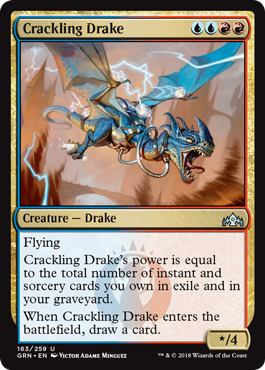 In short, the idea here is to fill your graveyard with instants and sorceries, then use the drakes as your beat sticks. Just for good measure, we threw in a pair of Wee Dragonauts for its prowess-like ability and a playset of Guttersnipes to get extra value out of all of the instants and sorceries you'll be casting. All-in-all, you're looking at a roster of 14 creatures compared to 20 instants and two sorceries. The instants are were you will be finding the bulk of your action. For traditional direct damage we're only running a playset of Lightning Strike to save the other slots for control and card advantage. The control cards we've chosen to include are a pair of Negate as well as a playset of two new counterspells: Ionize and Sinister Sabotage. 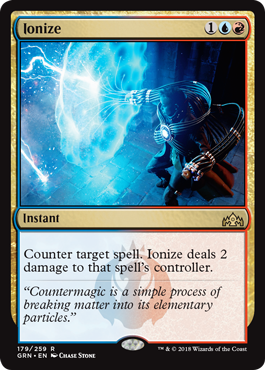 Ionize not only counters a spell, but shocks your opponent for two damage when its does so. Sinister Sabotage, while costing the same as a basic Cancel, adds in the Guilds of Ravnica's new surveil mechanic. 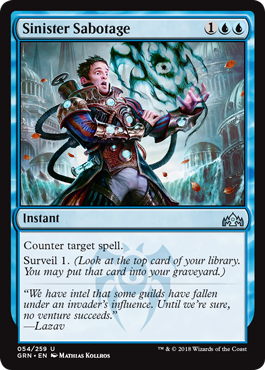 Not only does Surveil give you a scry-like function, it also lets you toss an unwanted land late-game or a free instant/sorcery into your graveyard to better fuel your drakes. There's a playset of Opt because, well, of course there is. And we've included a little spot removal with the surveil-equipped Unexplained Disappearance. For sorceries, we're only running two copies of Sleep with the idea being that it can lock down your opponent's defenders for that final swing for the kill. The sideboard finds two more copies of Negate and Unexplained Disappearance for matchups where you want a little more traditional control in your deck. Inescapable Blaze and Lightning Mare are there for when facing an opposing blue deck. Disdainful Stroke can take care of the likes of Vine Mare, Demanding Dragon, and other big and beefy threats. 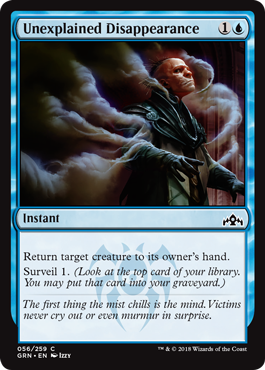 Sorcerous Spyglass shuts down a lot of on-the-battlefield threats (we're looking at you, Teferi! ), as does The Immortal Sun in addition to making your spells cheaper and giving you a little bit of extra card advantage. Most of the cards we've included in the sideboard are two-of's, but feel free to adjust as you seem fit. Everything all together, you're looking at roughly $93 worth of cards out of our self-imposed $100 budget. The deck goldfishes rather well and we've discovered that we typically only need two drakes out to really make an impact. In simulated digital games against pre-rotation standard decks, we've found that it has trouble against Teferi/Nexus of Fate just as much as any other deck. Outside of that matchup, it seemed to do pretty well versus Green Stompy and goes toe-to-toe with Red Deck Wins. White Weeny, however, always went wide much to fast for our deck to put up much of a fight. Pity. Are you planning on running something similar to this deck at your LGS or on MTGO? If so, leave us a comment and tell us how you fared!